So — Windows 10. This topic was brought up during the after meeting at my local club. Many of you are undoubtedly seeing the upgrade nag-screens. You too might be wondering: what’s changed in Windows 10, might have heard some of the issues surrounding the new operating system, and why the big push to upgrade. This month I’ll cover the new operating system from the perspective of what has happened so far and not from a ham radio perspective. Also to preface this whole thing, Microsoft has never been very clear about their statements and often retracts or goes back on things they’ve said. In other words, any of this may change as we go along. 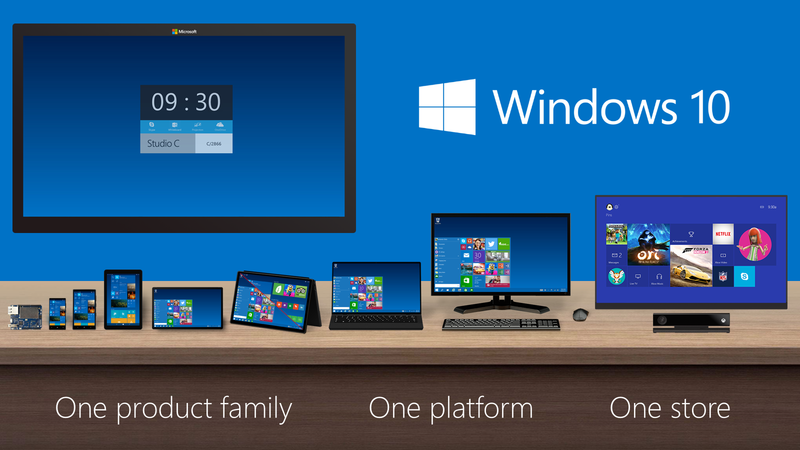 What is Windows 10?… why not Windows 9? There are many theories surrounding the choice in numbering. The named version of Windows hasn’t matched the real version number since Windows NT 4.0. 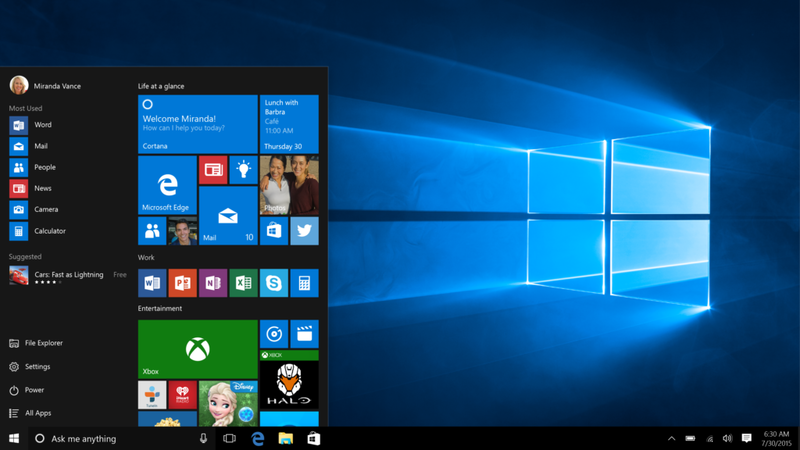 Windows 10 is the successor to Windows 8.1, but not Windows as you know it. It represents a shift in the direction of Microsoft as a company. Microsoft indicated this is the “the last version of Windows.” While they’re not killing it off, Microsoft is moving to a model they call “Windows as a service.” This means Microsoft will deliver innovations and updates in an ongoing manner instead of separate releases (versions) of Windows. The ultimate goal is to have one version of Windows that will run on all platforms. Everything, including Raspberry Pi, phones, tables, HoloLens (wearable, so called “smart-glasses”), laptops, desktop PCs, Surface Hubs (interactive whiteboards), and Xbox entertainment systems. Having one version of an operating system means all of these systems will become integrated and share information easily. A large part of this shift includes the use of “the cloud.” The cloud is a fancy term for someone else’s equipment on the Internet. The most common example is ‘cloud storage.’ Services like DropBox, Google Drive, or OneDrive allow you to save your documents and pictures elsewhere. You upload files to these services and you can access those files or share them with others on the Internet. The cloud is heavily integrated into Windows 10. After installing Windows 10, it will prompt you to sign in using a Microsoft Account. This syncs your user profile with the Microsoft cloud. When you sign into another device using your Microsoft Account, your settings will be the same across those devices. You can use Windows 10 without a Microsoft account. The computer will operate in standalone mode similar to previous versions of Windows. Microsoft’s online storage service called OneDrive is integrated into the operating system as well. Other new features include your new personal assistant, Cortana. She will help find things on your computer and the web, set reminders, similar to Apple’s Siri or Google Now. Universal apps: These first appeared in Windows 8 as “Metro Apps.” This concept is to have developers write one application and have it work the same way on any Windows platform. These apps are found and delivered via the Microsoft Store (similar to the Android Play Store or Apple’s App Store), and again – available on all platforms. Some games and applications that came preloaded in previous versions of Windows have been replaced with Universal Apps in 10. Edge browser: Microsoft Internet Explorer has been replaced with Microsoft Edge. It’s been touted as a more secure browser. However, this has yet to play out because browser extensions are very limited. Free upgrade: Legal copies of Windows 7/8/8.1 are eligible for a free lifetime upgrade to Windows 10 until July 29, 2016. There are some stipulations to this free upgrade. “Lifetime” means the lifetime of the device eligible for the free upgrade. When that device fails, you cannot transfer the free upgrade to another device. What happens after July 29th? Microsoft hasn’t said. The free upgrade is expected to become a premium upgrade that you’ll have to purchase, even for a device that was previously eligible for the free upgrade. 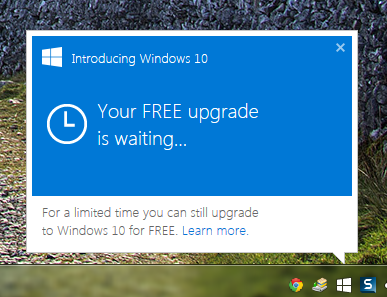 Versions prior to Windows 7 are not eligible for the free upgrade. 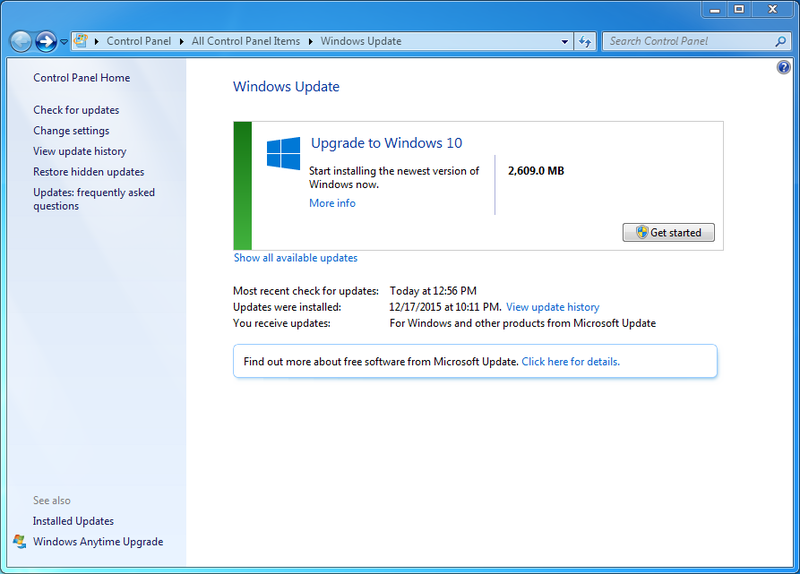 To be honest, if you’re running a version of Windows prior to 7, you probably want to upgrade your hardware for 10. Big upgrade push: Windows users have seen the icon in the system tray nagging them to upgrade. Why the big push? Microsoft is trying to avoid another Windows XP. At the time Windows XP was declared “end-of-life,” it accounted for about 10% of all computers on the Internet. Two years later, about 7% are still using XP. That’s a lot of users running a dead operating system. On top of that, Windows 7 will be 7 years old in July and only supported for 4 more years (until January 2020). While Windows XP maybe working great, there are reasons to get off of it. Google has been leading a push for a more secure Internet. Windows XP cannot handle many modern security methods in use today. All browsers in XP (except Firefox) will display ‘your connection is not private’ when connecting to a website that has more modern security then XP can understand. Since Windows XP is not a supported operating system, it won’t be updated to handle modern security methods. While the website will still work, your connection will be less secure. A work around for this security issue is to use Firefox. Though no known vulnerabilities exist in XP, best practice dictates users should remove unsupported operating systems from the Internet if it doesn’t need to be on the Internet. Another reason to upgrade is new hardware and software will not have support for old operating systems. The upgrade push for Windows 10 has been nothing short of a disaster. Last year, users eligible for the upgrade began seeing a Windows icon in the system tray saying ‘you’re PC is ready for your free upgrade.’ This deplorable tactic is commonly used by malware and spyware authors to trick you into installing software you don’t want or need. As an Information Technology professional with an interest in cyber security, this is the type of message I tell users NOT to acknowledge. Kind of ironic. Initially this tray icon came in the form of a Windows “Recommended” update. Then Microsoft upgraded it to a “Critical” Windows Update -yet another deplorable tactic. Despite this maneuver, Windows 10 is NOT a critical update. The upgrade popups are very confusing as the clickable options are: “upgrade now,” “upgrade later,” “OK,” or “Get Started.” Oh, it gets worse. Users are reporting they vigilantly closed the prompts to upgrade (clicked the red “X”) but their system was still upgraded automatically against their wishes. They went to bed with Windows 7 and got up the next morning to Windows 10. Surprise. 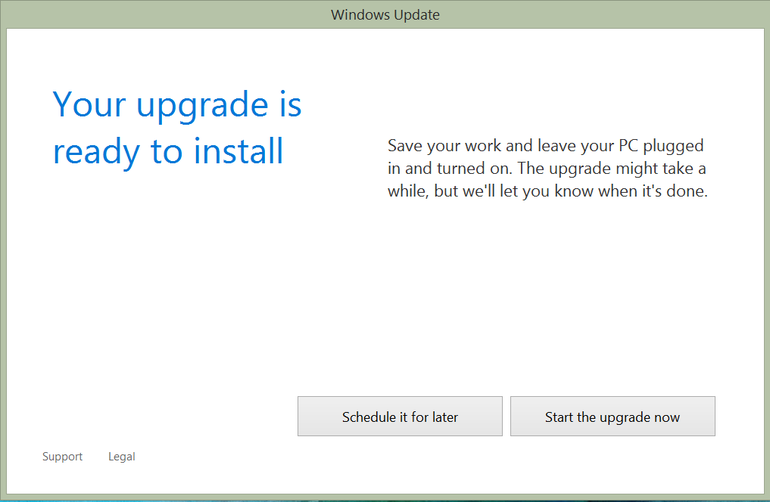 Once the upgrade happens, you do have 30 days to revert back to your previous version of Windows. The problem here is users have found the roll back frequently fails. Imagine that. ‘Don’t worry, you can go back… if you want. Opps, the roll back just failed! Guess you’re stuck.’ Thanks. Start Menu: Microsoft tried to remove the Start menu in Windows 8 and replaced it with a full screen tile menu. This was an attempt start a unified experience between PCs and mobile devices. The change worked fine on small screen devices but was a terrible experience on PCs. It was met with much outcry. The Start menu has returned in Windows 10 with something that kind of resembles the Start menu from Windows 7. It’s more of a combined Start menu — “Live Tile” experience. Live Tiles display updates like weather, news, and photos, while others are just a static application icon. Adding to the confusion, there now two places where system settings reside: “Settings” and “Control Panel.” Settings typically run between devices like time zone, personalization, notifications, and user accounts. The Control Panel is mostly desktop specific settings. Upgrade tips: create a full system backup using a backup service or create an image of your current installation on an external hard drive before attempting to upgrade. This is a backup incase the rollback fails. Check the vendor’s website of your hardware and critical software applications. 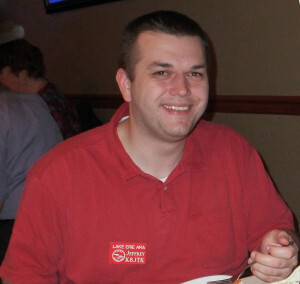 Look for driver support or knowledge base articles about Windows 10 before upgrading. Knowing whether your devices and software are supported will help minimize regret because your favorite app or device no longer works. Certainly some of these concerns have caused me to look at alternative operating systems. I have found in my deployments (I have yet to upgrade all of my desktops) with a little work, I can get 10 to act a lot like (my favorite) Windows 7. Turning off or uninstalling cruft helps a lot: turning off notifications, disabling camera & microphone usage, disable Cortana, remove many Universal Applications, and turn off background apps. I use Classic Shell to return a normal looking Start menu and Anti-Beacon to disable tracking. Links to those applications and ones to disable the upgrade nag-screens are below. Seriously, if you find any of these apps useful, consider donating to the author because we need to support those doing the right thing and allowing choice. Image sources: thurrott.com, zdnet.com, and blogs.windows.com. As always, use these at your own risk. https://www.safer-networking.org/spybot-anti-beacon/ (from the makers of SpyBot Search and Destroy, works on all versions of Windows).